Looking to update your kitchen, bathroom, mudroom, or laundry room, swimming pool, perhaps? Do you like natural products? Do you prefer natural, organic shapes? 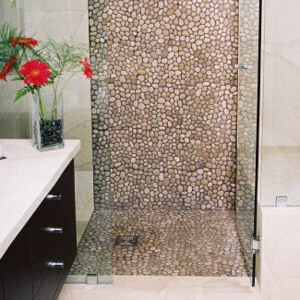 Then, decorating with pebble rock tiles may be for you! Beautiful, organic, natural, interesting and highly decorative are all words to describe pebble tiling. Just take a look at some examples provided in this article - the results are stunning! 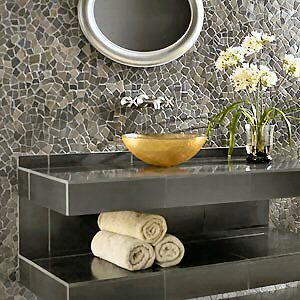 Use them for a fabulous backsplash in your kitchen, a full shower enclosure, the backsplash for your new bathroom vanity, flooring, or how about a decorative band of pebble tiles around your other ceramic, porcelain or slate tiles! Install it yourself...easily!...Yes easily! The majority of people do just that. 1. Measure the area you want to tile. Calculate how many tiles you will need. 3. Lay the squares next to each other vertically & horizontally and firmly press into the cement. 4. Once the cement has dried, wet the stones or simply apply a coat of sealer with a cloth (although the stones are very hard, any stone has some degree of porosity and will unnecessarily absorb some of the grout). Apply the grout over the top of all the stones and including the alternating open spaces at the edge of the rows. 5. Wait approximately 30 minutes and then sponge off the grout from on top of all the stones....thus the grout will remain between all the stones and at the end of rows. 6. Once the stones have dried completely, apply the sealer of your choice (retaining "natural appearance" or changing visual of stones using a semi-gloss, high-gloss or stone-enhancer). Pebble tiled floors and walls are extremely easy to maintain. Simply wash them with any mild household cleaner. And did you know that pebble tiled floors are extremely comfortable to walk and stand on? Yes, they are. In fact, they are even safer to walk on than most conventional hard flooring. These tiled floors offer more traction due to the slightly uneven (natural) surface which in turn, prevents slipping. This is why pebble rock tiling is very popular for showers, bathroom floors, and around any swimming pool! And don't worry about any outdoor application - pebble tiles are natural hard stones capable of handling very high or low temperatures and again, provide beauty and security! Remodeling your kitchen or bathroom flooring or backsplash or swimming pool surround, or patio bbq area, in a trendy, natural and organic decorating style is not only for the rich anymore! You too can enjoy these beautiful and practical pebble rock tiles in your home decor. Shelly Whitney is a Home Interior Specialist which includes Home Decorating and Design. Visit Shelly's website with even more home decorating advice.